It's been the central tenet of the Republican-controlled Congress for years now, and one of the biggest campaign promises of Donald Trump's winning presidential campaign, but now a new poll indicates that actual Republican voters are suddenly less enthused about the prospects of a massive effort to repeal the Affordable Care Act now that the GOP is in charge of every branch of federal government. A post-election survey released Thursday by the nonpartisan Kaiser Family Foundation found that support for a full repeal of the health care law, called Obamacare, has significantly decreased since Trump won the election last month. Of the 1,202 adults Kaiser surveyed from Nov. 15-21, only about one in four Americans (26 percent) responded that they support a full Obamacare repeal. And many of the law’s provisions remain popular, even across party lines, the survey found. Most popular remains the provision that permits young adults to stay on their parents’ insurance plans until age 26, which is supported by a full 85 percent of Americans. Even the law’s program for providing federal aid to states to help them expand their Medicaid programs for the poor is supported by 80 percent of Americans. Most of the drop in support for a real of the law comes from self-identifying Republicans in the survey. 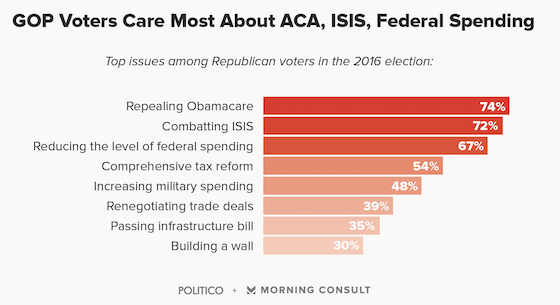 A little more than half — 52 percent — of Republican respondents said they want Obamacare to be repealed following Trump's election, compared to 69 percent of Republicans who supported full repeal ahead of the election in October. 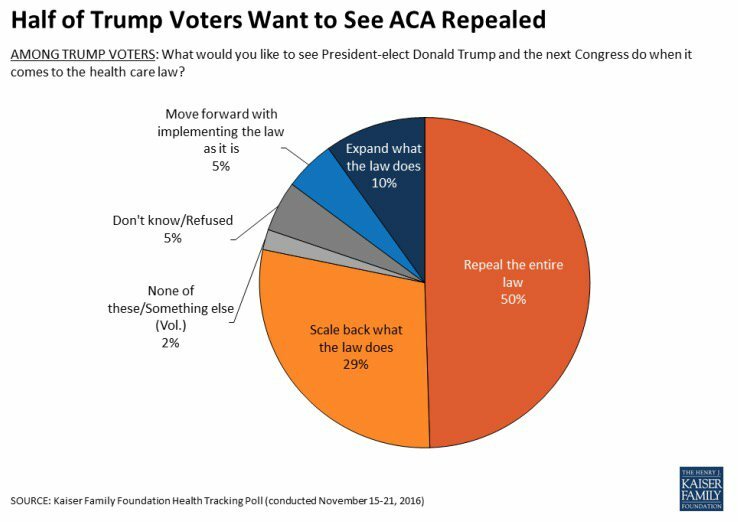 Still, 81 percent of respondents who voted for Trump told Kaiser that they hold an unfavorable view of Obamacare. The poll went on to illustrate that of the less than a quarter of a Americans who actually support a full repeal of the health insurance law , 77 percent would continue to do so even if it meant that 20 million Americans who had gained coverage through Obamacare would lose their health insurance. “While President-elect Donald Trump and Republican leaders in Congress work on a replacement to the Affordable Care Act, the new poll finds many of the law’s specific provisions remain popular even among President-elect Trump’s supporters, potentially complicating the path ahead,” the survey’s authors note. It could be that some Republicans "got a protest vote off their chests, and they're done with that," Kaiser CEO Drew Altman further explained. "They now have a more moderate position." This is a marked shift for Trump voters from even just days after his stunning electoral upset. One of Trump’s biggest campaign promises was a full Obamacare repeal within his first 100 days in office. While the president-elect has appeared to renege on several of his campaign promises, like banning Beltway lobbyists and Wall Street insiders from his incoming administration, his supporters have consistently cried for a repeal of Obamacare — until now. “To be frank, it’s more important he gets things moving, like getting rid of Obamacare and fixing the schools, and jobs,” a Pennsylvania Trump supporter recently told McClatchy when asked about his failure to "drain the swamp."